The Canadian midstream company Veresen Inc. (Veresen) took a leap in receiving from the US Department of Energy (DOE) the precious approval for exporting to the non-free trade agreement (non-FTA) countries liquefied natural gas (LNG) from its Jordan Cove LNG Export Terminal project in Oregon, on the West Coast of USA. With most of its gas pipelines activities concentrated in British Columbia and Alberta, the Calgary-based Veresen had originally planned the Jordan Cove LNG project as an import terminal as an extension of its transportation systems in the south in order to supply the US market before the shale gas revolution. Since this original plan, the shale gas revolution has expended to British Columbia and Alberta in addition to the existing production of heavy crude oil associated gas generating multiple LNG projects on the West Coast of Canada. Because of this historical heritage, Jordan Cove LNG is one of the very few LNG Export Terminal projects with Oregon LNG on the West Coast of the USA as all other projects are concentrated on the US Gulf of Mexico. In reducing by 50% the shipment lead time to Asia markets compared with the Gulf of Mexico and saving the costs to come across Panama Channel, Veresen intends to increase its market leadership. In this perspective Veresen obtained the Canada National Energy Board approval to export gas supply to USA in order to supply Jordan Cove LNG in the most competitive conditions. On the US side the DOE gave its approval for the import of this Canada sourced gas for up to 1.55 billion cubic feet per day (cf/d). Only the Federal Energy Regulatory Commission (FERC) approval is missing to allow Veresen to start Jordan Cove LNG Export Terminal construction. 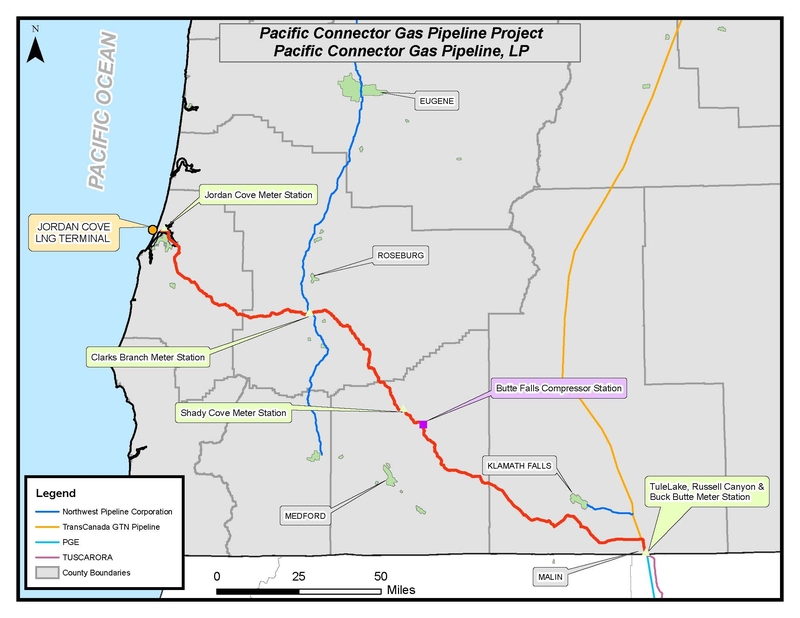 To supply Jordan Cove LNG Terminal with Canadian gas, Veresen established the Pacific Connector Gas Pipeline LP 50/50 joint venture together with the US midstream company Williams Companies LP (Williams) to design and build a 370 kilometers gas pipeline to connect Canadian Veresen pipeline system to existing Williams US pipeline system reaching the Port of Coos Bay in Oregon where Jordan Cove LNG Terminal lies. According to the commercial agreements in place, Veresen is planning to build two LNG trains of 3 million tonne per year (t/y) each in a first phase but it owns the licence for a third LNG train to export up to 9 million t/y LNG. Since Veresen completed the front end engineering and design (FEED) for the first phase of the Jordan Cove LNG project, it will move ahead for the construction as soon as the FERC approval has been granted. While the construction of the Jordan Cove LNG Export Terminal Phase-1 will start on second half of 2014, Veresen expects to extend its binding commercial agreements to secure the capacity required to initiate the Jordan Cove LNG Export Terminal Expansion project by 2015.